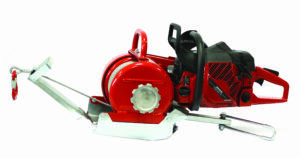 KBF winch is a universal, multi-purpose forestry winching device which can be powered by any chainsaw motor via a dedicated adapter. Thanks to its sturdy but lightweight design (around 35 kg without motor), which takes so little space it can be carried in the boot of any car, this winch is an ideal solution for pulling and dragging heavier loads with a direct tractive force of up to 10 kN (ca. 1000 kp) at the speed of 30 m/min – even on the roughest terrains. for public protection in rescue services and fire brigades as a useful tool in the event of natural disasters and traffic accidents where other – normally heavier and bulkier – equipment wouldn’t allow quick or direct access to the site of rescue. All these features put KBF WINCHES ahead of its rivals, heavier and less operator-friendly stationary winches. KBF WINCHES are practically indispensable on rough, inaccessible terrains where all other portable and tractor winches fail to deliver, resulting in the need for manual manipulation of loads. Izdelava spletnih strani Reklame ŽARN.